If you find any bugs or have any suggestions, I would really appreciate it if you leave them as comments on this post. I can also be contacted through my email (see the About the author page). One last thing… If you enjoy the CC PDF Converter and you also need to extract data from PDF files to Excel than I would be honored if you could take a couple of minutes to check out our commercial product. 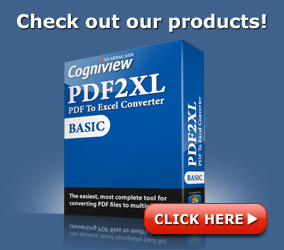 It is a professional PDF to Excel conversion utility which is used by over 10,000 companies around the world. If you decide to get PDF2XL you’ll be saving a ton of time on PDF data conversion and helping us create more open source tools for PDF users.